Human beings have wanted to fly since before recorded history. In the Greek legend, Daedelus and Icarus built wings of bird feathers and beeswax. Leonardo de Vinci experimented with bird wing-type designs for flight. And even though we now build airplanes, people are still intrigued by flying with real wings. There are stories about jet packs and inventors with weird flying suits. Flash Gordon style-serials at the movie theaters must have inspired some of these. There are also more sinister flying beings, like the Jersey Devil, space aliens, or the Mothman, who always seem to be with us. 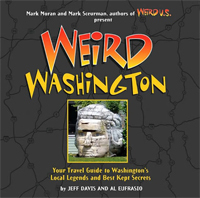 And, you guessed it – Washington has had two reported sighting of strange flying men or man-like beings. According to some investigators, on the afternoon of January 6, 1948, Mrs. Bernice Zaikowski was standing outside her farmhouse on the outskirts of Chehalis, Washington. 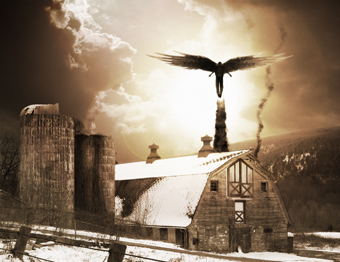 Something in the air attracted her attention, and she looked up to see a man flying about twenty feet above her barn. He was flying vertically, kept aloft by a set of silver wings. The wings were fastened to a kind of harness, and she heard a whizzing or whirring sound, which came from the wings or harness. As she watched, Mrs. Zaikowski saw the man reach up to his chest to adjust what she thought were controls on the harness. It was after 3:00 p.m., and school was out. Some children approached, watching the man with her. They asked permission to walk through her garden to get a better look at the flying man. A few minutes later, the man flew away. This sighting took place shortly after several UFO sightings in Washington State and other areas of the U.S. The plane flown by the Air Force officers investigating the Maury Island sighting three months earlier had crashed a few miles away from Mrs. Zaikowski’s home; was there any connection, or was this some kind of tall tale? Mrs. Viola Johnson told reporters that on April 8 of the same year, she saw not just one flying man, but three. Around 3:00 p.m., she took a break from her job at City Cleaners in Longview. She went outside and saw what she thought was a small flock of seagulls flying toward her. As they got closer, she saw that the gulls were really three men wearing what she described as gray, Minute Man style uniforms. They began circling over the cleaners, at an altitude of about two hundred and fifty feet. She rushed inside the cleaners and alerted her co-workers to the strange sight outside. Everyone ran to the nearest exits to look at the three men. Only the janitor, James Pittman made it out in time. Pittman told reporters that he too saw three men flying in the air, wearing some kind of strapped-on motor. He only had a quick glimpse, but said that he did not see any wings on the men, just a harness, as they flew away northward at “medium” speed. Johnson and Pittman said that a boy standing outside also saw the flying men. It is interesting that although the two stories were similar, they had some very different details. Mrs. Zaikowski saw one man, and did not mention any uniform, so presumably her flier wore some kind of ordinary clothing, like overalls or pants and jacket. Mrs. Johnson saw three men dressed in distinctive uniforms. But the big difference is how the men flew. Although the men in both sightings wore some kind of chest harness that made mechanical sounds, Mrs. Zaikowski’s flier had wings, while Mr. Pittman reported that the men did not have wings on their harnesses. Needless to say, there are some problems with the credibility of both stories. Although the Chehalis sighting has been described on several websites and in magazines such as Fate, there are a few oddities. A check of the Chehalis City register showed that Mrs. Zaikowski and her husband had lived on the outskirts of Chehalis for nearly ten years before the incident. However, the local newspaper did not carry any stories of flying men on January 6, or for the week afterward. This should have been front-page news. Newspapers from Tacoma and Portland did not carry the story, either. In addition, during the first week of 1948, the Chehalis area received record levels of rainfall. Rivers flooded and the farm fields were mudflats. What was Mrs. Zaikowski doing – standing outside in the rain? And would the schoolchildren really want to stand in her muddy garden? Would this have been good flying weather for our winged man? 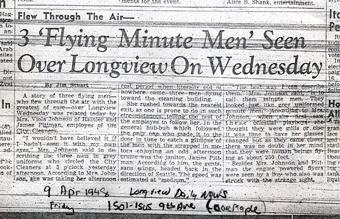 Perhaps it was so wet that he waited a few weeks to try out his flying equipment again in April, because unlike Mrs. Zaikowski’s sighting in Chehalis, the Longview Daily News carried Mrs. Johnson’s story on the front page, on April 9th. Although the story appeared on the front page of the Daily News, there were no follow up stories – but the newspaper archive reveals one interesting story that might provide a clue to the mystery of the Longview Minute Men sighting. On April 7th, the Longview Daily News had a front-page story declaring that it was National Laugh Week. In the article, the writer recommended that people across the country play practical jokes, such as using dribble glasses on co-workers and family members. He wrote, “In these days of stress, having a laugh at anyone’s expense is worth enjoying.” He suggested that there was some kind of competition to send in the funniest story. It is tempting to believe that Mrs. Johnson and Mr. Pittman staged the sighting to fool their co-workers, and the whole thing got out of hand when the reporter questioned them. On the other hand, could it indeed be some kind of conspiracy at work? Were the Men in Black active in Washington State, hiding evidence of high-tech flying suits from the general public? The Air Force did not admit the existence of a manned jet pack until the late 1950s. If it’s true that they had it earlier, they did their work very well, because the flying men failed to reappear either in Longview or in Chehalis after the first sightings.